Notes: The Blue Damsel Parachute utilizes the wingpost as a thorax by bringing the post forward and securing with thread wraps just behind the eye. 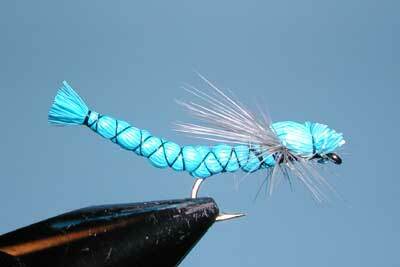 The parachute hackle helps support the fly as well as the hollow deer hair used for the body. Since there are no wings on the fly, casting is much imporved, particularly on the windy days when this pattern is most effective. This pattern is also effective in Tan and Green colors. Dress the fly with floatant and allow the fly to lay on the water with just a few twitching actions.